PH lamps are iconic and were designed by Poul Henningsen for the Danish lighting manufacturer Louis Poulsen, founded in 1874. 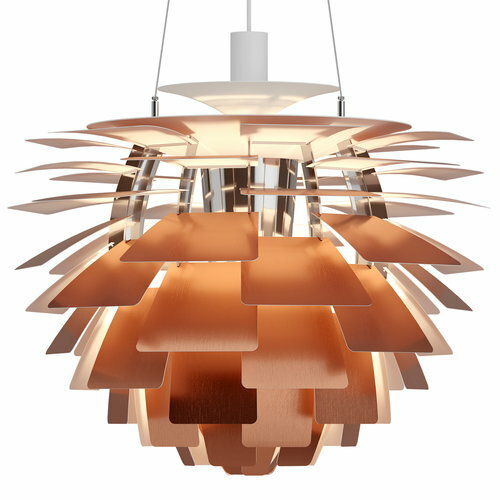 The PH lamp might be more familiar to you as the “Artichoke” lamp which is now commonly called the PH Artichoke lamp. Midcentury Scandinavian furniture, such as the PH Artichoke lamp, helped define the look of an era. There are many versions of the famous artichoke lamp. The shades or lens of the lamp make it unique because Henningsen was the first designer to create a lamp with lens to deflect direct light. It is remarkable to know that the PH Artichoke lamp, created in 1958, still looks so futuristic in 2018. The lamp has 72 perfectly positioned leaves forming 12 rows of leaves emitting a lovely diffused light. Henningsen was not only a designer but also a journalist, critic, and editor. His lamps won Gold medals in the International Exhibition for Decorative Art held in Paris. The now-legendary PH lamp is available with a three shades system. It comes in many contemporary finishes with the original style now costing a little under $12,000. The vision of Henningsen is remarkable. He created a lamp that was futuristic looking in 1958 and is still futuristic looking in 2018. And he is one of many great designers who created lighting, furniture and architecture with a profound vision. Follow this blog for the discovery of more visionary designers.